For his son, Frank Forrester Church IV, the Unitarian Universalist minister and theologian, see Forrest Church. Frank Forrester Church III (July 25, 1924 – April 7, 1984) was a United States Senator from Idaho , serving four terms from 1957 to 1981. Church was a member of the Idaho Democratic Party. Frank Church was raised in Boise, Idaho . In his youth, Church admired William E. Borah, who then represented Idaho in the United States Senate. Church graduated from Boise High School in 1942, where he served as student body president. As a junior in 1941, he won the American Legion National Oratorical Contest. The prize was sufficient to provide for four years at the college of the winner's choice. Church chose Stanford University , enrolling in 1942. In 1943, Church enlisted in the U.S. Army and served as a military intelligence officer in the China-Burma-India theater. Following his discharge in 1946, he returned to Stanford to complete his education, receiving his bachelor's degree in 1947. Also in 1947, he married Bethine Clark, daughter of Chase A. Clark, a former Democratic governor of Idaho, and entered Harvard Law School . After one year at Harvard, Church transferred to Stanford Law School, when he thought the cold Massachusetts winter was the cause of a pain in his lower back. The pain did not go away and the problem was soon diagnosed as testicular cancer. After one of his testicles and glands in his lower abdomen were removed, Church was given only a few months to live. However, he rebounded from the illness after another doctor started X-ray treatments. This second chance led him to later reflect that "life itself is such a chancy proposition that the only way to live is by taking great chances." In 1950, Church graduated from Stanford Law School and returned to Boise to practice law. Frank and Bethine had two sons, Frank Forrester Church IV, who died in 2009, and Chase Clark Church, who lives in Boise. Church became an active Democrat in Idaho and after an unsuccessful try for the State Legislature in 1952, he ran for the United States Senate in 1956. After a closely contested primary election against former Senator Glen H. Taylor, Church handily defeated Republican incumbent Herman Welker in the general election. At the age of 32, Church became the fifth youngest member ever to sit in the U.S. Senate. Church was reelected three times (1962, 1968 and 1974), the only Democrat ever to win reelection to the U.S. Senate from Idaho. Upon entering the Senate in January 1957, Church made the mistake of voting on a measure against the wishes of Democratic Majority Leader, Lyndon Johnson, and Johnson punished Church by all but ignoring him for the next six months. Church found solace from Republican Minority Leader, William Knowland. However, Church managed to find his way into Johnson's good graces by providing key assistance in getting the Civil Rights Act of 1957 passed. LBJ was so grateful he made the young Idahoan a veritable protégé, rewarding him with plum assignments, such as a seat on the prestigious Senate Foreign Relations Committee, a position which allowed Church to follow in the footsteps of his idol, William Borah. 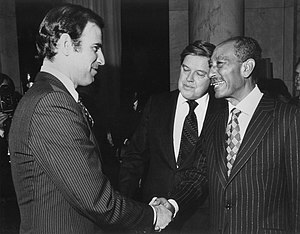 Church was a key figure in American foreign policy during the 1970s, and served as chairman of the Senate Committee on Foreign Relations from 1979 to 1981. He was one of the first senators to publicly oppose the Vietnam War in the 1960s, although he had supported the conflict earlier. He was the co-author of two legislative efforts to curtail the war: the Cooper-Church Amendment of 1970, and the Case-Church Amendment of 1973. Church argued that the opponents of the Vietnam War needed to prevent the corruption of the nation and its institutions. To Church, the anti-war opposition was the "highest concept of patriotism — which is not the patriotism of conformity — but the patriotism of Senator Carl Schurz, a dissenter from an earlier period, who proclaimed: 'Our country right or wrong. When right, to be kept right: when wrong, to be put right." Church gained national prominence during his service in the Senate through his chairmanship of the Church Committees, which conducted extensive hearings investigating extra-legal FBI and CIA intelligence-gathering and covert operations. Together with Senator Sam Ervin's committee inquiries, the Church Committee hearings laid the groundwork for the Foreign Intelligence Surveillance Act of 1978. The committee also investigated CIA drug smuggling activities in the Golden Triangle and secret U.S.-backed wars in Third World countries. Church is also remembered for his voting record as a strong liberal and environmental legislator, and he played a major role in the creation of the nation's system of protected wilderness areas in the 1960s. In 1964, Church was the floor sponsor of the national Wilderness Act. In 1968, he sponsored the Wild and Scenic Rivers Act and gained passage of a ten year moratorium on federal plans to transfer water from the Pacific Northwest to California . Working with other members of Congress from northwestern states, Church helped establish the Hells Canyon National Recreation Area along the Oregon-Idaho border, which protected the gorge from dam building. He was also the primary proponent in the establishment of the Sawtooth Wilderness & National Recreation Area in central Idaho in 1972. Church also was instrumental in the creation of Idaho's River of No Return Wilderness in 1980, his final year in the Senate. This wilderness comprised the old Idaho Primitive Area, the Salmon River Breaks Primitive Area, plus additional lands. At 2.36 million acres (9,550 km²), over 3600 square miles, it is the largest wilderness area in the nation outside of Alaska. It was renamed the Frank Church-River of No Return Wilderness in March 1984, weeks before his death, and is known regionally as "The Frank Church." Frank Church was considered a liberal (remarkable considering that he represented one of the most conservative states in the nation); however, not all of his positions were liberal. Throughout his tenure in the Senate, Church was an opponent of gun control legislation. He also, in 1979, was the first in Congress to disclose and protest the presence of Soviet combat troops in Cuba. According to the Christian Science Monitor, this stance somewhat disarmed his opponent's charge in the 1980 campaign that Church's performance on the Foreign Relations Committee had helped to weaken the US militarily.In 1974, Church joined Senator Frank Moss, D-Utah, to sponsor the first legislation to provide federal funding for hospice care programs. The bill did not have widespread support and was not brought to a vote. Congress finally included a hospice benefit in Medicare in 1982. In late 1975 and early 1976, a sub-committee of the U.S. Senate led by Church concluded that members of the Lockheed board had paid members of friendly governments to guarantee contracts for military aircraft in a series of illegal bribes and contributions made by Lockheed officials from the late 1950s to the 1970s. In 1976, it was publicly revealed that Lockheed had paid $22 million in bribes to foreign officials in the process of negotiating the sale of aircraft including the F-104 Starfighter, the so-called "Deal of the Century". In 1976, Church sought the Democratic nomination for president. Although he won primaries in Nebraska, Idaho, Oregon and Montana, he withdrew in favor of the eventual nominee, former Georgia governor Jimmy Carter. Church remains the only Idahoan to win a major-party presidential primary election. In the late 1970s Church was a main congressional supporter of the Torrijos-Carter Treaties, which proposed to return the Panama Canal to Panama . The latter position proved to be widely unpopular in Idaho and led to the formation of the "Anybody But Church Committee" (ABC), committee created by the National Conservative Political Action Committee (NCPAC), based in Washington, D.C. ABC and NCPAC had no formal connection with the 1980 Senate campaign of conservative Republican congressman Steve Symms, which permitted them, under former Federal election law, to spend as much as they could raise to defeat Church. Church lost in his attempt for a fifth term to Symms by less than one percent of the vote. His defeat was blamed on the activities of the Anybody But Church Committee and the national media's early announcement of Republican presidential candidate Ronald Reagan's overwhelming win in Idaho. These predictions were broadcast before polls closed statewide, specifically in the Pacific Time Zone. Many believed that this caused many Democrats in the more politically moderate Idaho Panhandle to not vote at all. , Church is the last Democrat to represent Idaho in the U.S. Senate. Following his 24 years in the Senate, Church practiced international law with the Washington, D.C. , firm of Whitman and Ransom, specializing in Asian issues. Three years after leaving the Senate, Church was hospitalized for a pancreatic tumor on January 12, 1984. Less than three months later, he died at his home in Bethesda, Maryland , on April 7, 1984, at the age of 59. His funeral was held in Boise and televised throughout Idaho. Church was buried at Morris Hill Cemetery in Boise. Church received an honorary doctorate from Pennsylvania's Elizabethtown College in 1983 to honor his work for the American people during his career in public office. His papers, originally given to Stanford University in 1981, were transferred to Boise State University at his request in 1984. Church is widely quoted in regards to the National Security Agency : "I don't want to see this country ever go across the bridge... I know the capacity that is there to make tyranny total in America, and we must see to it that this agency and all agencies that possess this technology operate within the law and under proper supervision, so that we never cross over that abyss. That is the abyss from which there is no return." p. 121. Schmitz uses the example of "The Doves Have Won and Don't Know It" September 6, 1970 on CBS television, 2.2/32/IS, FCP; "The Doves Have Won," September 11, 1970 (Source of the "highest concept of patriotism..." quote), speech at Mills College of Education; "The Doves are Winning — Don't Despair," September 26, 1970, speech at Colorado State University and "The Unsung Victory of the Doves," December 1970, 10.6/8/8 FCP.